Early Summer Map. Enjoy the tour! Providence Art Windows has asked for the return of this work by Peter Green in light of Bank of America pulling out as a tenant of 111 Westminster Street. Peter is a longtime resident of downtown Providence, a witness of nature and architecture coexisting seamlessly. He is a keen observer of the small moments of beauty that happen in urban life that may elude the casual bystander. This is the view from my desk, so I see the tower all day long and the constantly changing sky behind it. One day the sky was a deep shade of purple. It was almost unbelievable, so I took a picture with my iPhone resting on the window sill. Then another day the clouds looked like pink comets, so I took another picture. I shared them with a friend who works in the building and she replied “Isn’t 111 beautiful? !” -- I didn’t know people had referred to the building as “111” so that gave me the idea to continue the series through the year and create 111 pictures of 111 Westminster. Many of the pictures are beautiful on their own, but seeing them all together and comparing the changing colors is the most impressive way to view the series. If you look closely you can find a blimp, helicopters, airplanes, and the rare wild peregrine falcons who live on the tower. The Director, Rebecca Siemering, will be leading a walk on Thursday, June 20th, at 6PM from the University of Rhode Island Library at 80 Washington Street. Come and learn about the program, as well as view the most recent installation by Project Open Door students. 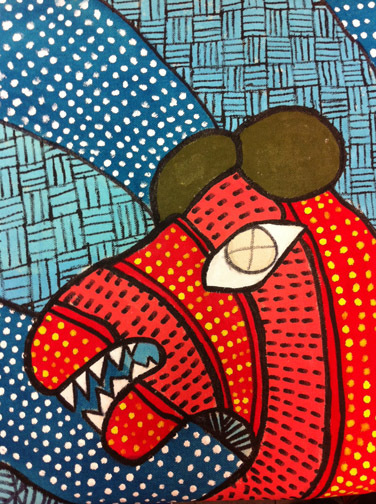 The students in this program from across Rhode Island, took 15 windows and transformed them with creatures, animals and monsters referenced in mythology from around the world. 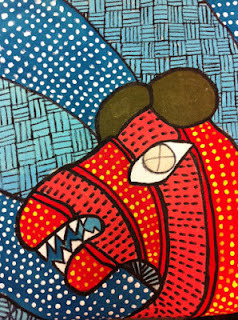 Join us from 5-9 on this evening, and walk to other Gallery Night venues. Providence Art Windows exhibits juried art and art installations to fill empty retail spaces and participating gallery spaces. Our shows change three times a year and feature local and nationally known artists. 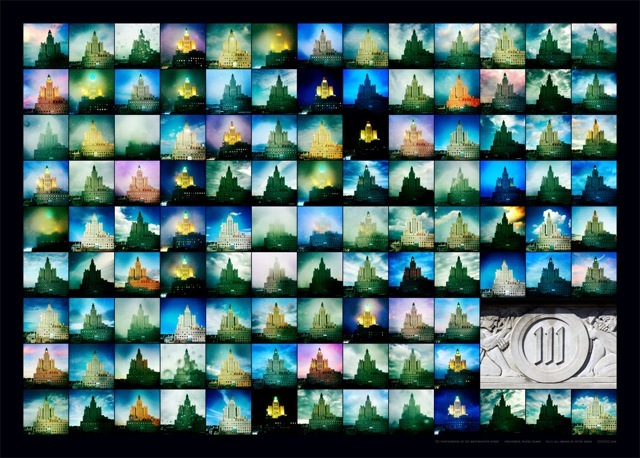 -5-10 images of your work as jpegs, no larger than 2 mg.
-Label each image as last name_#1, lastname_#2, etc. Images labeled “PAW” get lost or confused with other applicants and will not be reviewed. It is helpful to know for the jury that you have experience in whatever you propose, though not necessary. Please look at the blog and Flickr page to see past projects. Juries are held once once a year, with new installations going up in March/July/December. Stipend of up to $300 available. 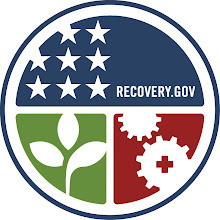 In 2010, funded in part by the Arts Jobs program of the New England Foundation for the Arts, made possible with funding from the National Endowment for the Arts and the American Recovery and Reinvestment Act. "PAW has already stamped itself indelibly on the artistic consciousness of the city." 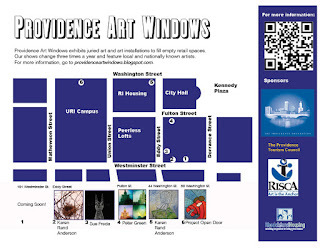 Providence Art Windows is generously supported by The Providence Foundation, Fidelity Investments, the City of Providence, Rhode Island State Council on the Arts and Verizon. Thank you to our past and present donated Windows sites: Trinity Repertory Company, University of Rhode Island, Johnson and Wales, Two Brothers Beauty Supply, Rhode Island Housing and Newbury Street Management. Advisory Committee includes Diana Gaston (Fidelity Investments), Ruth Dealy(artist), Steven Pennell (URI), and Judith Tolnick Champa (Independent Curator). 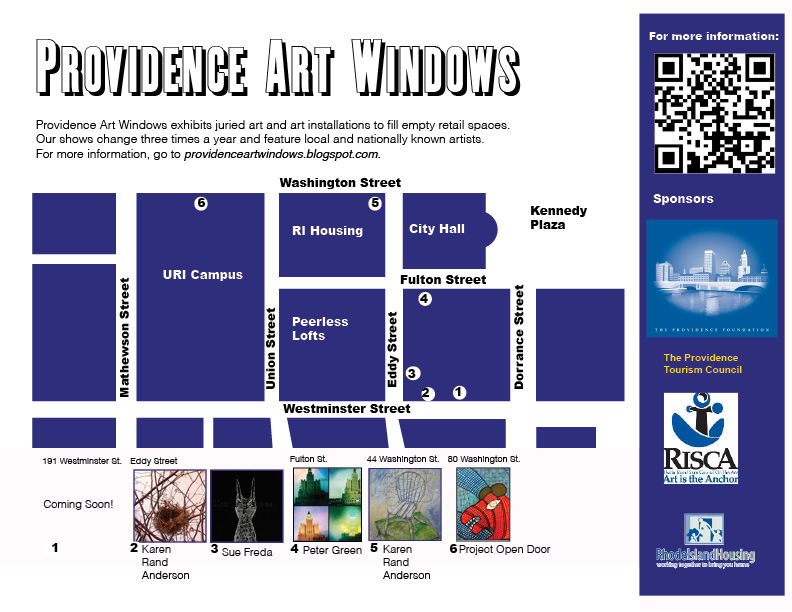 Providence Art Windows exhibits juried art and art installations to fill 10 empty retail spaces in Downtown Providence. Our shows change three times a year and feature local and nationally known arts artists,juried by local residents, downtown artists and professionals. Providence Art Windows adds to the walking experience in the revitalized Downcity area for locals and tourists alike. PAW Director Rebecca Siemering is an alum of PAW from the 2007 season. An experienced arts administrator, she took over the project in late 2007 from artist/administrator Elizabeth Keithline, who began the program. Providence Art Windows wins "People's Choice" for best Public Exposure for Artists during the 2008 Boston Art Awards. This first annual celebration was organized by The New England Journal of Aesthetic Research to honor the best art made in New England (excepting Connecticut) in 2008. Put together by artist and critic Greg Cook, PAW was honored to accept, and brought PAW founder Liz Keithline along for the kudos. PAW was in good company with other Rhode Island winners, including 5 Traverse Gallery, Neal Walsh, Scott Lapham, Xander Marro and many more. A great night, and we will work hard to be brought back again next year. The Providence Foundation, Fidelity Investments, the Dept. of Arts, Culture and Tourism of Providence, RISCA and Verizon.